Perfect for Brazilian waxing, this gentle, fragrance-free formula leaves little to no irritation when removing resistant, coarse hair. Natural Shea Butter conditions and leaves skin soft and hydrated. The excellent flexibility of the resins allows for use on all body parts. available in 3.5oz & 16oz size.This finely milled unscented cornstarch was designed to allow the technicians to see the hair, absorb oils and perspiration, aid in the performance of the wax and act as a protective barrier between the skin and wax. available in 16oz and 1/2 gallon size.Natural and fragrance free. Used to remove makeup and oil before depilatory waxing. Also an excellent astringent or toner. The ultimate all-purpose wax! Unique formulation is ideal for any area of the body to effectively remove fine, medium and coarse hair. With the addition of Rose essential oil this product contains hydrating and antiseptic qualities making it suitable for all skin types. This unique formulation brings you the next generation of soft, flexible and effective hard waxes. Combined with Egyptian Geranium, Spanish Sage and Lime Oil to soften and heal the skin this product effectively removes coarse to fine hair. An excellent choice for Brazilian waxing. relieves redness and helps prevent ingrown hairs. gently but effectively,removes excess oils,make-up,dirt,etc.while desensitizing the skin. a lower temperature,gentle,hard wax for removing hair from more sensitive skin areas without epilating strips. 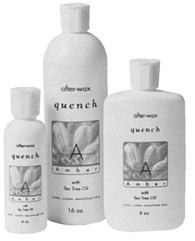 a lower temperature hard wax for removing more resistant hair without using epilating strips.